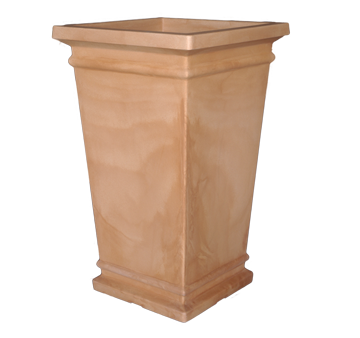 Tall Quadro Alto terracotta pots are manufactured in Italy. This Italian rotational molder has perfected the process of creating a lightweight poly pot that is not only durable, but also replicates aged terracotta clay pots. Available in 36" height with a 22" Top O. D.
Virtually indestructible, architectural grade rotationally molded designer polymer resin. Quadro Alto planters are UV protected from sun light and have excellent freeze/thaw characteristics. 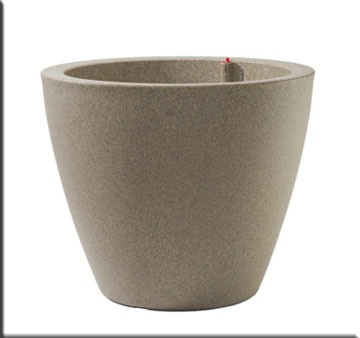 Quadro Alto terracotta pots can handle the most inclement weather conditions. Landscape architects, interiorscapers, landscape contractors and interior designers have utilized this Italian resource for ease in installation without compromising the the beauty of specifying aged clay terracotta pots for their projects. Planters FOB Florence, South Carolina ensuring prompt delivery throughout the United States. Rotationally molded tall Quadro Alto Terracotta pots represent a viable lightweight alternative to conventional planters of clay, concrete or aggregate materials. Quadro Alto planters are up to 50% lighter than terracotta or concrete planters allowing easy installations. These architectural quality planters have an extra thick wall for strength and durability. Planter Part # Ref. # Top OD Top ID Base ID Ht. Gal. Wt. Saucer Part # Ref. # Dia. Wt.